Power Panels are a very popular merchandising display, used on gondola end caps, off a variety of different types of shelving and also on temporary point of purchase corrugated floor displays. 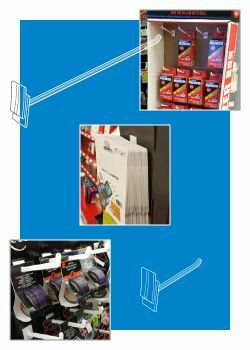 Clip Strip carries display construction merchandising materials to meet your requirements to produce these fixtures such as power panel hooks in 2", 4" and 6" lengths. Minimum quantity for "2" Corrugated Power Panel Display Hooks - Plastic, CP-2" is 50. Minimum quantity for "3" Corrugated Power Panel Display Hooks - Plastic, CP-3" is 50. 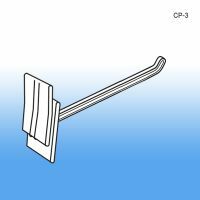 Minimum quantity for "4" Corrugated Power Panel Display Hooks - Plastic, CP-4" is 50. Minimum quantity for "6" Corrugated Power Panel Display Hooks - Plastic, CP-6" is 50. 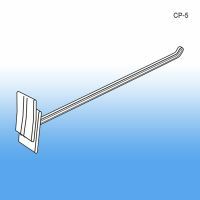 Minimum quantity for "5" Corrugated Power Panel Display Hooks - Plastic, CP-5" is 50. Minimum quantity for "8" Corrugated Power Panel Display Hooks - Plastic, CP-8" is 50.